Brand image is important for any business. When consumers buy a product or service, they aren't just buying a product or service; they're buying what your brand stands for. That's why it's so important to design your brand image to convey exactly what you want it to say. Building a Brand Image can ocur as a start-up or as an established company re-branding. Branding is not about your brand. It’s about your customers, prospects and employees and what your product or service – in fact, your whole company – can honestly do and be for them. 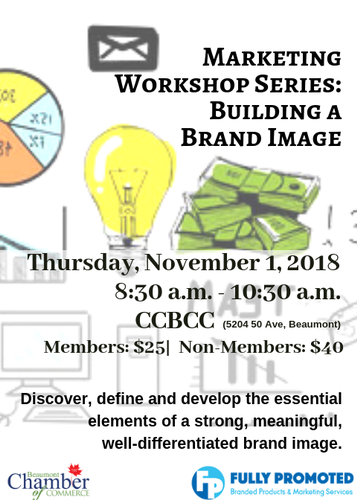 This workshop will help you discover, define and develop the essential elements of a strong, meaningful, well-differentiated brand image. We will provide water, coffee, tea and a light snack for those who need a quick boost of energy and hydration. Marleen Martin has a rich and varied background including Recreation Director for the City of Calgary, years as an elementary/middle school teacher and over 35 in the hospitality industry in various roles. Her formal education includes degrees with Distinction in Kinesiology and Education. A zest for travel and love for working with people took her to the years skies where she worked as a flight attendant with Westjet for 5 years. The world of business then lured her in when she became owner of Fully Promoted, a promotional products and marketing services company and Magnetsigns an advertising company. Bringing her passion for learning and sharing knowledge into the business world, she has delved into the marketing field; she enjoy’s the challenge of staying current in an ever changing marketing world. Marleen spent 18 years as a hockey mom of her 2 boys she proudly raised. She wasn’t ready to leave the rink however as she’s now joined a women’s league. Other passions include being crew member for a drag racing team, running and her 4 legged grand babies.